Gritty, bright, cutting tone with great sustain. 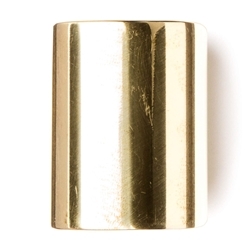 For years, these brass slides have been chosen for their bright resonant tone and comfortable weight. Medium Wall: 19mm inside diameter x 22mm outside diameter x 60mm length, fits ring size 9 Heavy Wall: 22mm inside diameter x 29mm outside diameter x 60mm length, fits ring size 13 Perfect for that vintage Delta sound. Order today.